I went to Dalhousie University in Halifax, Nova Scotia, in 1973 as a marine biologist with interests in nitrogen cycling in coastal systems. My discovery of a novel nitrogen-fixing bacterium associated with saltmarsh cord grass led to an invitation to collaborate with Dr. Johanna Dobereiner at EMBRAPA in Brazil on research into similar associations in tropical grasses including sugarcane. The work of this group stimulated my interest in the potential of organic farming in temperate regions for nitrogen self sufficiency. (In the 1970s, organic farming was generally viewed as suitable for subsistence farming but not for mainstream farming in North America & Europe.) I collaborated with individual farmers and groups of farmers to investigate this topic and in the 1980s became involved in the development of standards for certification of organic farms. In that connection, I acted as a 3rd party certification agent for several organic farming organizations, inspecting farms in the three Maritime provinces and Maine. I also conducted assignments related to organic farming for IDRC (International Development Research Center) in southeast Asia and Africa and collaborated with the CIPAV group in Colombia. In the 1990s, I worked with a local landscaping company in their development of an organic approach, introducing use of white clover as a key lawncare practice. Undergraduate Honors and Graduate students were involved in these activities. In the late 1990s I began to develop web applications for teaching. In the 2000s, I headed a team that developed and delivered two fully online introductory biology classes, the goal being to facilitate more convenient access to a major introductory level class. Circa 2004, I began to study the natural history within my bioregion which I arbitrarily defined as the region within 50 km driving distance from downtown Halifax. I retired in 2008. Since then, I have been active in and served on the boards of several natural history and environmental organizations. I am webmaster and writer for nswildflora.ca, halifaxfieldnaturalists.ca, backlandscoalition.ca, the Wildland Writers and I write a blog under the heading Nova Scotia Forest Notes. I feel very fortunate. From my youth, my dream was to live in Nova Scotia where my family roots lie. Now I have lived most of my life here and our "kids" and grandkids are still sharing the experience. It is also a place I am still just getting to know. During the summers of 1962-1965, I was a crew member/scientific assistant on the M.V.Salvelinus conducting fisheries, benthic and oceanographic surveys along the coast of Beaufort Sea. As the son of a teacher at BCS, I grew up as a "school brat" on the campus of this private school in the Eastern Townships of Quebec. I only wish we valued public education sufficiently that all of our youth could benefit from an education of this sort. Outdoor/experiential education in natural history, wilderness protection, photography, writing & admin for websites. Halifax Field Naturalists 2016 and the Environment Stewardship Award from CARP (Canadian Association of Retirees and Pensioners) in 2017. Talk for the Aethenaeum Society of Nova Scotia, Oct 16, 2017. Co-author: Nick Hill. To M ersey Tobeatic Research Institute   Old Forest S c i e n c e   C o n s e r v ation Conference, Debert, N.S. Oct 19-21, 2016. 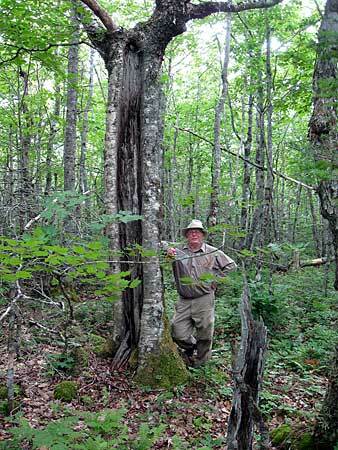 Talk and Field Trip for Young Naturalists Club, Halifax, Sep. 19 & 27, 2015.
to the The Atlantic Rhododendron and Horticultural Society, Feb. 5, 2013. For the Native Plant Talk Series, May 10, 2012. Talk and Field Trip for Young Naturalists Club, Halifax, Sep. 17 & 25, 2011. Joint presentation by Dusan Soudec (Water) and David Patriquin (Land) to the AGM of the Woodens River Watershed Environmental Organization Feb 17, 2010.